Despite being the author of “Smart Chefs Stay Slim” ($26, New American Library), Allison Adato never meant to write a diet book. “I started by just wanting to explore how chefs eat,” says Adato, a senior editor at People magazine, who was curious about whether the chefs prepared haute cuisine for their families, what they chose as snacks and how they stocked their home kitchens. While interviewing 40 of the country’s top names in food — including several behind D.C. restaurants — Adato found that their strategies for keeping weight down could come in handy for anyone. The main rule they all seem to follow is the title of the first chapter: “Eat What You Love.” For people whose passion is food, deprivation isn’t a realistic option. But sticking with proper portion sizes is. Chefs also don’t waste calories on stuff that just happens to be around, says Adato, who’s applied that lesson in her life. “I don’t need to eat a doughnut at work because someone brought them in,” she says. And you won’t find her tossing away broccoli stems now that she’s learned from chef Thomas Keller about the joys of eating veggies “nose to tail.” He’s put Swiss chard ribs on the menu at Per Se, so there’s no reason to dump them down the disposal at home. Besides, shopping for good ingredients becomes more affordable when you’re using all of them. Any money you save can go toward chocolate. Adato’s favorite tip came courtesy of Eric Ripert, whose Washington outpost is West End Bistro. He has a habit of eating a little chocolate every day. Even a square can satisfy your sweet tooth, and the better the quality, the less likely you are to overindulge. “If you buy a $10 chocolate bar, you’re not going to scarf it down,” Adato says. Smith sometimes overdoes it with calories, like when he gets a craving for a Good Stuff Eatery burger with fries and a milk shake. But he always gets back on track the next day with a meal of oatmeal and an egg-white omelet. Breakfast is also a ritual for Susur Lee, the owner and chef of Thomas Circle’s Zentan. He told Adato that every morning he digs into a bowl of his homemade muesli to wake up his digestive system and get energy for the day. It’s lower in sugar than the boxed varieties available in most stores. But the best part of the no-cook recipe to Adato is that it’s something anyone can make, even if you’re not a chef. Mix ingredients together. Serve a portion (1/4 to 1/2 cup) in a bowl with 1 tablespoon of Greek yogurt, a splash of milk and a small trickle of honey. 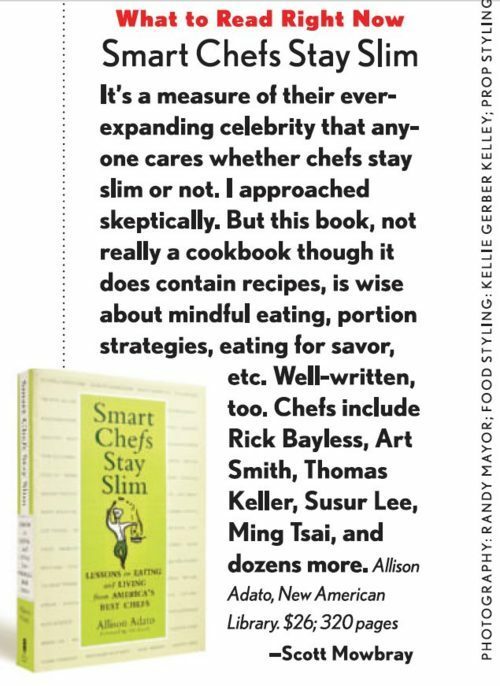 From “Smart Chefs Stay Slim: Lessons in Living and Eating from America’s Best Chefs” by Allison Adato. Reprinted by arrangement with New American Library, a division of Penguin Group (USA) Inc. Copyright © Allison Adato, 2012. (NEW YORK) Top chefs who spend long, late hours preparing meals for others, face greater temptation than most mortals to over-eat but they say small portions, healthy snacks and drinking plenty of water can help to keep the weight off. Like many Americans, chefs struggle with the battle of the bulge. If he is not careful chef Marc Murphy, of the Landmarc restaurant in New York, admitted he can nibble on up to two plates of fried potatoes during a busy day at his restaurant. To offset the additional calories during week he refrains from drinking alcohol. "I try to do cleanses Monday to Friday," he said during a panel discussion moderated by author Allison Adato at the New York City Wine and Food Festival. Adato's recent book, ‘Smart Chefs Stay Slim: Lessons in Eating and Living from America's Best Chefs’, was the basis for the event. Murphy also uses fresh herbs to cut the amount of oil and butter in his dishes, and reduces the temptation to over-eat at friends' restaurants, where extra dishes can flow freely from the kitchen by chefs eager to impress, by letting it be known he wants nothing extra. "I just want to eat what I order," the 43-year-old said. It took a health scare for Art Smith, the owner of the restaurant Table 52 in Chicago, to change his eating habits. Just before his 50th birthday he was diagnosed with Type 2 diabetes, the illness that killed his father. Since his diagnosis, the 52-year-old who occasionally works as the personal chef of President Barack Obama and television personality Oprah Winfrey, has shed up 54 kg by eating smaller meals, taking up running and boxing and eating healthy snacks. "I keep almonds and apples around when I'm on the go," he said. Sue Torres, the owner of Suenos in New York, recommends a hearty breakfast to keep trim, and likes steel-cut oatmeal with different fruit toppings each morning. Torres, who is known for her Mexican cuisine, also uses chili and other flavourful ingredients to reduce the amount of fat in her cooking. "You could have cream and butter, but it's about portions," the 39-year old chef explained. Celebrity US Chef Katie Lee, 31, is also careful about what she eats. "From Monday to Friday, I am very disciplined. I try to have 70 to 75 per cent of my plate filled with vegetables. On Saturday and Sunday, I have more fun," she said, adding that she also exercises like a mad person. While chefs are careful about they eat, they sometimes splurge so they don't feel deprived. Although Murphy abstains from alcohol during the week, when he has a tipple he also makes sure he drinks plenty of water. Although his doctor has told him, "The ice in your Scotch doesn't count."